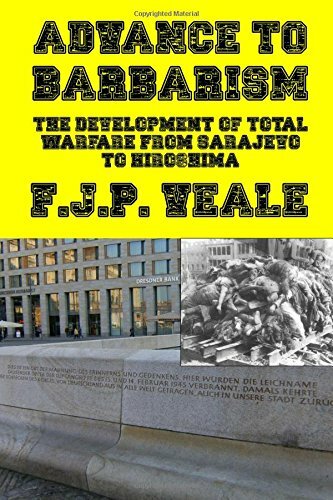 I am reading “Advance to Barbarism,” by FJP Veale. I will, as has come to be my practice, offer more than one post based on this book. I will begin with a topic upon which Veale spends only a few words, but one which sheds light on perhaps the main purpose of war – at least war in the era of life in a time of something more than primitive living. The various wars are often explained by the critics as wars for resources – usually oil, but also natural gas, transit pipelines, etc. I have come to believe (and first came across this notion at The Daily Bell) that wars are for control – control of the people: the ultimate productive and renewable resource on the planet. To a hunting community, a prisoner of war is merely an extra mouth to feed…. Generally, prisoners taken in battle would be disposed of summarily with a stone club. Advance to Barbarism: ... F.J.P. Veale Check Amazon for Pricing. They fought over game – the meaningful “natural resource” of the time. But as soon as a state of civilization had been reached in which there were fields to be tilled, walls, temples, palaces and tombs to be built, and mines to be worked, a prisoner of war ceased to be merely an extra mouth to feed, and came to possess a definite economic value as a slave. They fought to capture labor – the most meaningful “natural resource” in even the most rudimentary division-of-labor economy. For much of history, the “labor” captured was slave labor. But it need not be so – it isn’t so today, at least not literally. I do not intend to trivialize actual slavery by comparing it to what we have today; at the same time, it is worth noting the yoke under which we struggle. To mention only a few points: fiat money, taxation, regulation, prohibitions of all sorts. To note the effectiveness of the current system, it is sufficient to point out that the slaves at least knew they were under the whip of the master; today’s masters have developed a system of control so invisible that many cannot see it. With the franchise to vote and otherwise petition the state – “we the people” – we are conditioned to believe that we are the ones in control. Most believe they are free. War expands the franchise – bringing more people under one or more of the many globalizing institutions: central bank controlled money and credit, international finance, centrally managed trade; opportunities for manipulation by the World Bank, IMF, WTO, and the UN. Investment opportunities are opened for the crony capitalists. When you have developed a system that allows you to skim a few points off of every transaction, why care about oil? Bringing more people under the yoke of that system allows you to skim a few points off of a few more people. This is the reason for the wars – to capture the labor, to make the labor work for the elite. It used to be done via slaves. Today? Look in the mirror.